BMW gained commendable attention throughout the last year with rumors linked with their new to-be-released model. 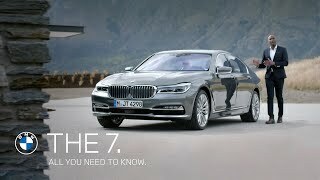 However the wait is finally over and at the 2015 Frankfurt Motor Show company finally took the curtains off their all new BMW 7 Series UK Version 2016. The series offers new drivetrain option and has better design theme and tech gadgets. 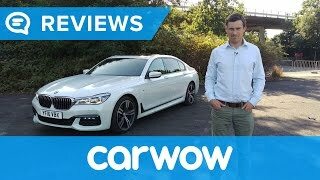 Let us have a closer look at the details through the review of BMW 7 Series UK Version 2016. When we talk about a luxury sedan and that too one from the house of BMW, interior is a primary space of concentration. I must say that company commendably satisfies this thirst of yours. Delivering maximum space for the rear passengers, the models come with Rear Executive Lounge Seating Package providing the passenger sitting at the right side the additional pop-out footrest and a seatback reclining up to 42.5 degrees. The panoramic roof too now comes with an option, if buyer by any means feel to have the Panoramic Sky Lounge LED Roof. This isn’t everything; there are many tech features too. The Model has 5.0 inch touch display featuring iDrive and uses 3D sensors to detect pre-selected hand gestures to perform any task. The rear occupants will have a removable tablet measuring seven-inch and 16 speakers roaring with 1,400 watts from the Bowers and Wilkins Diamond. In all rounding up the interior details of the BMW 7 Series UK Version 2016 I would say, it is worth the penny and time. The exterior of BMW 7 Series UK Version 2016 doesn’t have that much of excitement as the interior has but I won’t even say it’s waste of time. There is a new styling for the current series. Starting with the front fascia the traditional kidney grille sits amidst the narrow and wide – shaped headlights, giving the models more aggressive touch. There is chrome accent line at the lower portion while the rear gets sportier taillights and integrated exhaust outlets. As I mentioned the design language has confined changes and the same concludes with short decklid. This is that we can have new in the exterior details of BMW 7 Series UK Version 2016, let us see if passionists appreciate it or not. 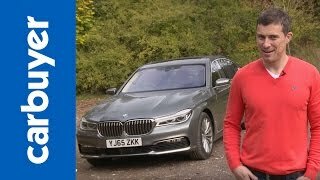 The BMW 7 Series UK Version 2016 power figures includes; 740i and 750i xDrive variants. The former is housed with a 3.0 liter six-cylinder engine generating total output of 320 hp and peak torque of 447 nm while the latter comes with a 4.4 liter V8 cranking total output of 445 hp and peak torque of 650 nm. Both the engines are paired to an eight-speed automatic transmission. 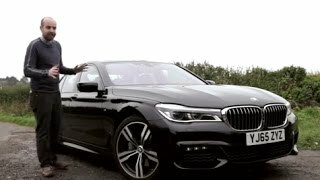 The performance figures of these BMW 7 Series UK Version 2016 variants are also appreciable reaching the top speed of 130 mph while the 0-60 mph sprint can be knocked in 5.4 seconds and 4.3 seconds respectively.